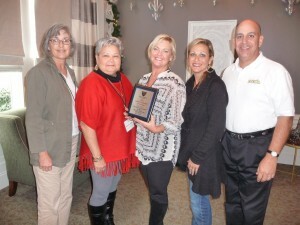 LTA Award Winners (left to right seated) Angel Ellis, GBRCTA Community Coordinator; Yvette Marshall, GBRCTA Secretary; Marty Engle, GBRCTA League Administrator; Kyle Savant and Robby Economides, tournament directors, Crawfish Classic; Rusty Jabour, GBRCTA President, Jennifer Edmonson and Kay Willson, GBRCTA board members; and Dillon and Alex Braud, LSU Tennis Club. 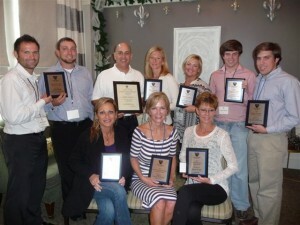 Congratulations to the Greater Baton Rouge Community Tennis Association (GBRCTA) and to the following Baton Rouge area tennis coordinators, players and HPTA members who were honored by the Louisiana Tennis Association on Dec. 8, 2012, in Lafayette! Honored for their work at the November 2012 State Combo Tennis Tournament were (left to right), Lisa Sanner, Forest Park site director; Joycelyn LeBlanc, Highland Park associate director; Kay Willson, tournament director; Angel Ellis, GBRCTA community coordinator; and Rusty Jabour, Highland Park site director.